Hawthorne, Nathaniel. GRANDFATHER'S CHAIR, FAMOUS OLD PEOPLE, and LIBERTY TREE. Boston: R. P. Peabody, 1841. 3 vols. First editions. Original basket-weave slate cloth for first two volumes, and deep blue pebbled cloth for third volume (and first setting), black glazed labels on each cover, as issued. Only mild rubbing; some lettering faintly visible on the first and third labels which are wholly intact; marginal chipping along right edge of second label; a very good attractive set of these juveniles, seldom found together. Housed in a moire cloth box. BAL 7590, 7591, 7592. Clark A6.1, A7.1, and A8.1. Boston: E. P. Peabody, 1841. First editions. Hardcover. Very good overall. Two volumes of children's stories on American history from the Puritans to the American Revolution, by the author of 'The Scarlet Letter' and 'The House of the Seven Gables'. 32mo, in original diced brown cloth with black paper label on front boards (blank). Housed in a sleeve in green gilt morocco box. Grandfather's Chair: 1st Edition, 16mo, vii, [1 (blank)], 140 pp. 16mo. 5 1/4" x 3-1/2". (BAL7590; Clark A6.1). Famous Old People: 1st Edition vii, [1 (blank)], 158, [2 (blank)] pp. 16mo, 3 3/8x5". (BAL7591; Clark A7.1). Overall, text is extremely clean. Covers of both volumes slt rubbed, corners rubbed on G.C. ; 2 small marks on spine & traces of a glue repair at inner hinge of F.O.P, title labels very slt chipped at right edges. Very pleasant contemporary copies in a handsome dark green morocco spined slipcase. HAWTHORNE, Nathaniel. Grandfather's Chair: A History for Youth. Orig. cloth with black paper label on front cover. Boston: E.P. Peabody; New York: Wiley & Putnam, 1841. 16mo. First edition. BAL 7590. Free endpapers lacking, hinges weak internally but holding, cloth faded, else very good. Together with: HAWTHORNE, Nathaniel. Famous Old People: Being the Second Epoch of Grandfather's Chair. Orig. cloth with black paper label on front cover. Boston: E.P. Peabody, 1841. 16mo. First edition. BAL 7591. These 2 rare early Hawthorne titles are housed together in a custom brown quarter morocco clamshell box. A third title, Liberty Tree, was also issued in 1841. Paper label chipped, cloth faded, rear cover stained, else very good. Boston: E.P. Peabody, 1841. True Stories from New England History, 1620-1808 HAWTHORNE, Nathaniel. Grandfather's Chair: A History for Youth. Boston: E.P. Peabody. New York:-Wiley & Putnam, 1841. First edition. Sixteenmo (4 7/8 x 3 1/4 inches; 124 x 82 mm.). viii,  - 140. Publishers basket-weave plum cloth, cream endpapers. 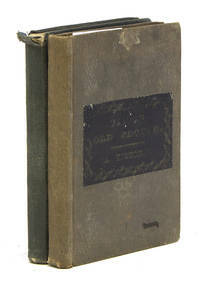 Without the gilt lettered black paper label on the front cover, otherwise a near fine copy of this scarce little book. Chemised in a quarter dark green morocco slip-case. BAL, 7590; Browne, p. 38. Seller: David Brass Rare Books, Inc.
Boston / New York: E. P. Peabody / Wiley & Putnam, 1841. 1st Edition (BAL7590; Clark A6.1). Original publisher's brown basket-weave cloth binding with black title label to front board. General wear & soiling to binding. Spine sunned. Title label a bit faded. Some foxing to paper. Period pos to preliminary blank. Very Good.. vii, [1 (blank)], 140 pp. 16mo. 5" x 3-3/8"
E. P. Peabody. Hardcover. Boston, 1841. First Edition. Brown cloth covered boards; edges worn; paste on on front board is worn and faded, small tears in spine ends; 5" tall; no jacket. Previous owner's name on free front endpaper; gutter cracked at page 72; light spotting throughout; 140 pages. . Good. 1841. 20100619. Good. Ships with Tracking Number! INTERNATIONAL WORLDWIDE Shipping available. May not contain Access Codes or Supplements. May be ex-library. Shipping & Handling by region. Buy with confidence, excellent customer service! 2011-10-24. Good. Ships with Tracking Number! INTERNATIONAL WORLDWIDE Shipping available. May not contain Access Codes or Supplements. May be ex-library. Shipping & Handling by region. Buy with confidence, excellent customer service! 2015-04-22. Good. Ships with Tracking Number! INTERNATIONAL WORLDWIDE Shipping available. May not contain Access Codes or Supplements. May be ex-library. Shipping & Handling by region. Buy with confidence, excellent customer service! Grandfather's Chair: A History For Youth. 20110921. Good. Ships with Tracking Number! INTERNATIONAL WORLDWIDE Shipping available. May not contain Access Codes or Supplements. May be ex-library. Shipping & Handling by region. Buy with confidence, excellent customer service! 2014-03-28. Good. Ships with Tracking Number! INTERNATIONAL WORLDWIDE Shipping available. May not contain Access Codes or Supplements. May be ex-library. Shipping & Handling by region. Buy with confidence, excellent customer service! 2014-03-28. New. Ships with Tracking Number! INTERNATIONAL WORLDWIDE Shipping available. Buy with confidence, excellent customer service! 2009-01-13. New. Ships with Tracking Number! INTERNATIONAL WORLDWIDE Shipping available. Buy with confidence, excellent customer service! 20150518. New. Ships with Tracking Number! INTERNATIONAL WORLDWIDE Shipping available. Buy with confidence, excellent customer service! 2017-01-06. New. Ships with Tracking Number! INTERNATIONAL WORLDWIDE Shipping available. Buy with confidence, excellent customer service! 2017-01-06. Good. Ships with Tracking Number! INTERNATIONAL WORLDWIDE Shipping available. May not contain Access Codes or Supplements. May be ex-library. Shipping & Handling by region. Buy with confidence, excellent customer service! 2010-11-04. New. Ships with Tracking Number! INTERNATIONAL WORLDWIDE Shipping available. Buy with confidence, excellent customer service! 2009-01-13. Good. Ships with Tracking Number! INTERNATIONAL WORLDWIDE Shipping available. May not contain Access Codes or Supplements. May be ex-library. Shipping & Handling by region. Buy with confidence, excellent customer service! 2010-11-04. Good. Ships with Tracking Number! INTERNATIONAL WORLDWIDE Shipping available. May not contain Access Codes or Supplements. May be ex-library. Shipping & Handling by region. Buy with confidence, excellent customer service! 2009-12-01. Good. Ships with Tracking Number! INTERNATIONAL WORLDWIDE Shipping available. May not contain Access Codes or Supplements. May be ex-library. Shipping & Handling by region. Buy with confidence, excellent customer service! 2019. Leather Bound. New. Leather Binding on Spine and Corners with Golden Leaf Printing on round Spine (extra customization on request like complete leather, Golden Screen printing in Front, Color Leather, Colored book etc.) Reprinted in 2019 with the help of original edition published long back . This book is printed in black & white, sewing binding for longer life, Printed on high quality Paper, re-sized as per Current standards, professionally processed without changing its contents. As these are old books, we processed each page manually and make them readable but in some cases some pages which are blur or missing or black spots. If it is multi volume set, then it is only single volume, if you wish to order a specific or all the volumes you may contact us. We expect that you will understand our compulsion in these books. We found this book important for the readers who want to know more about our old treasure so we brought it back to the shelves. Hope you will like it and give your comments and suggestions. Lang: - eng. EXTRA 10 DAYS APART FROM THE NORMAL SHIPPING PERIOD WILL BE REQUIRED FOR LEATHER BOUND BOOKS. COMPLETE LEATHER WILL COST YOU EXTRA US$ 25 APART FROM THE LEATHER BOUND BOOKS. New York: Chatterton-Peck Good in blue cloth-covered boards showing wear to edges, fading and surface tears to spine, fading and soiling to panels. Starting to inside hinges, inscribed "From Mother" and dated "Xmas 1908." Light fading to pages o/w clean and bright.. Hard Cover. Good. Chatterton-Peck. N.D.. Hardcover. Pale green cloth; cover illustration. Spine sunned; gutter chipped; some wear/soil. Stpehn Rowland's (Brooklyn) stamp and inscription. Light toning. .
2019. Leather Bound. New. Leather Binding on Spine and Corners with Golden Leaf Printing on round Spine (extra customization on request like complete leather, Golden Screen printing in Front, Color Leather, Colored book etc.) Reprinted in 2019 with the help of original edition published long back . This book is printed in black & white, sewing binding for longer life, Printed on high quality Paper, re-sized as per Current standards, professionally processed without changing its contents. As these are old books, we processed each page manually and make them readable but in some cases some pages which are blur or missing or black spots. If it is multi volume set, then it is only single volume, if you wish to order a specific or all the volumes you may contact us. We expect that you will understand our compulsion in these books. We found this book important for the readers who want to know more about our old treasure so we brought it back to the shelves. Hope you will like it and give your comments and suggestions. Lang: - eng, Pages 318. EXTRA 10 DAYS APART FROM THE NORMAL SHIPPING PERIOD WILL BE REQUIRED FOR LEATHER BOUND BOOKS. COMPLETE LEATHER WILL COST YOU EXTRA US$ 25 APART FROM THE LEATHER BOUND BOOKS. 2019. Leather Bound. New. Leather Binding on Spine and Corners with Golden Leaf Printing on round Spine (extra customization on request like complete leather, Golden Screen printing in Front, Color Leather, Colored book etc.) Reprinted in 2019 with the help of original edition published long back . This book is printed in black & white, sewing binding for longer life, Printed on high quality Paper, re-sized as per Current standards, professionally processed without changing its contents. As these are old books, we processed each page manually and make them readable but in some cases some pages which are blur or missing or black spots. If it is multi volume set, then it is only single volume, if you wish to order a specific or all the volumes you may contact us. We expect that you will understand our compulsion in these books. We found this book important for the readers who want to know more about our old treasure so we brought it back to the shelves. Hope you will like it and give your comments and suggestions. Lang: - eng, Pages 302. EXTRA 10 DAYS APART FROM THE NORMAL SHIPPING PERIOD WILL BE REQUIRED FOR LEATHER BOUND BOOKS. COMPLETE LEATHER WILL COST YOU EXTRA US$ 25 APART FROM THE LEATHER BOUND BOOKS. 2019. Leather Bound. New. Leather Binding on Spine and Corners with Golden Leaf Printing on round Spine (extra customization on request like complete leather, Golden Screen printing in Front, Color Leather, Colored book etc.) Reprinted in 2019 with the help of original edition published long back . This book is printed in black & white, sewing binding for longer life, Printed on high quality Paper, re-sized as per Current standards, professionally processed without changing its contents. As these are old books, we processed each page manually and make them readable but in some cases some pages which are blur or missing or black spots. If it is multi volume set, then it is only single volume, if you wish to order a specific or all the volumes you may contact us. We expect that you will understand our compulsion in these books. We found this book important for the readers who want to know more about our old treasure so we brought it back to the shelves. Hope you will like it and give your comments and suggestions. Lang: - eng, Pages 298. EXTRA 10 DAYS APART FROM THE NORMAL SHIPPING PERIOD WILL BE REQUIRED FOR LEATHER BOUND BOOKS. COMPLETE LEATHER WILL COST YOU EXTRA US$ 25 APART FROM THE LEATHER BOUND BOOKS. 2019. Leather Bound . New. Leather Binding on Spine and Corners with Golden Leaf Printing on round Spine (extra customization on request like complete leather, Golden Screen printing in Front, Color Leather, Colored book etc.) Reprinted in 2019 with the help of original edition published long back . This book is printed in black & white, sewing binding for longer life, Printed on high quality Paper, re-sized as per Current standards, professionally processed without changing its contents. As these are old books, we processed each page manually and make them readable but in some cases some pages which are blur or missing or black spots. If it is multi volume set, then it is only single volume, if you wish to order a specific or all the volumes you may contact us. We expect that you will understand our compulsion in these books. We found this book important for the readers who want to know more about our old treasure so we brought it back to the shelves. Hope you will like it and give your comments and suggestions. Lang: - English, Pages 298. EXTRA 10 DAYS APART FROM THE NORMAL SHIPPING PERIOD WILL BE REQUIRED FOR LEATHER BOUND BOOKS. COMPLETE LEATHER WILL COST YOU EXTRA US$ 25 APART FROM THE LEATHER BOUND BOOKS. 2019. Leather Bound. New. Leather Binding on Spine and Corners with Golden Leaf Printing on round Spine (extra customization on request like complete leather, Golden Screen printing in Front, Color Leather, Colored book etc.) Reprinted in 2019 with the help of original edition published long back . This book is printed in black & white, sewing binding for longer life, Printed on high quality Paper, re-sized as per Current standards, professionally processed without changing its contents. As these are old books, we processed each page manually and make them readable but in some cases some pages which are blur or missing or black spots. If it is multi volume set, then it is only single volume, if you wish to order a specific or all the volumes you may contact us. We expect that you will understand our compulsion in these books. We found this book important for the readers who want to know more about our old treasure so we brought it back to the shelves. Hope you will like it and give your comments and suggestions. Lang: - eng, Pages 248. EXTRA 10 DAYS APART FROM THE NORMAL SHIPPING PERIOD WILL BE REQUIRED FOR LEATHER BOUND BOOKS. COMPLETE LEATHER WILL COST YOU EXTRA US$ 25 APART FROM THE LEATHER BOUND BOOKS.